The Pink Power Lithium Ion Cordless Drill Kit for Ladies has all the flair you need without sacrificing strength. We combined a stand out color, lightweight design and a high-power motor so you can tackle any project with efficiency and personality. Weighing in at just under three pounds with the battery, this tool is light enough to use for long periods of time without wearing you out. The 0-550RPM motor will give you enough power to hang drywall or just hang pictures. We have also added a Lithium-Ion battery, an upgrade from our previous models with NiCad batteries, to offer you a longer battery life with a shorter charge time. Our upgraded Lithium Ion battery drill has all the same features as our NiCad model, just with more kick. Our drill features a built-in bubble level to improve accuracy. It also showcases an LED light that automatically turns on when the trigger is held to help make it easier to work in dark and confined workspaces (such as cabinets, while assembling furniture or when in poorly lit areas). The latest feature we've added is our new magnetic base that allows you to place loose screws or bits on the tool itself, keeping you hands-free. Each drill kit comes with a full one-year warranty and satisfaction guarantee. 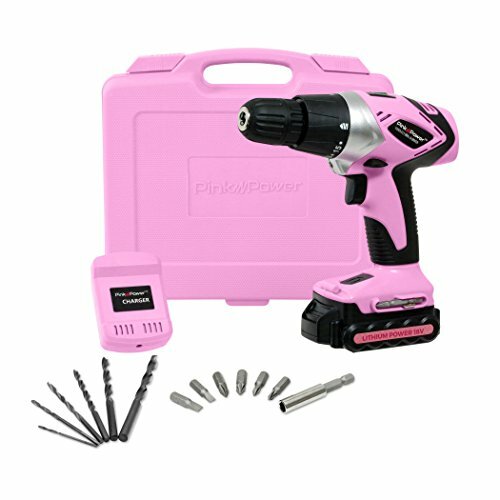 Pink tool kit includes: pink power drill, tool case, battery charger, drill bit set, one Lithium Ion 18V battery and a one-year warranty. Compact cordless drill driver includes a built in LED light that activates when triggering the drill making it easier to work in dark or confined work spaces. The built-in bubble level helps improve accuracy, while the magnetic base is perfect for holding loose screws or bits. This electric drill weighs just under 3lbs, with the battery, so it is easy for anyone to use. The perfect addition to any hand tool or power tool set.